The strawberries in this recipe are lightly mashed with a potato masher (yes, I still own one:) or a fork. 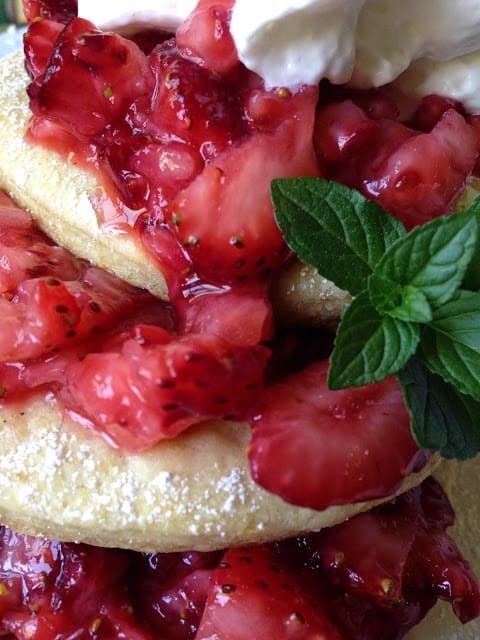 The strawberries are tossed with granulated sugar and finely diced crystallized ginger. This mixture is allowed to macerate for an hour. Macerate basically means one of two things; to soak a food, usually fruit, in a liquid in order to infuse it with the liquids flavor. A spirit such as brandy, rum or a liqueur is usually the macerating liquid or to sprinkle fruit with sugar and let mixture sit for a few hours to allow the fruit to release its juice. Mix starter, egg and oil in a bowl. Add sugar, salt and soda, mix well. Spoon onto a lightly greased griddle or skillet over medium-high heat. 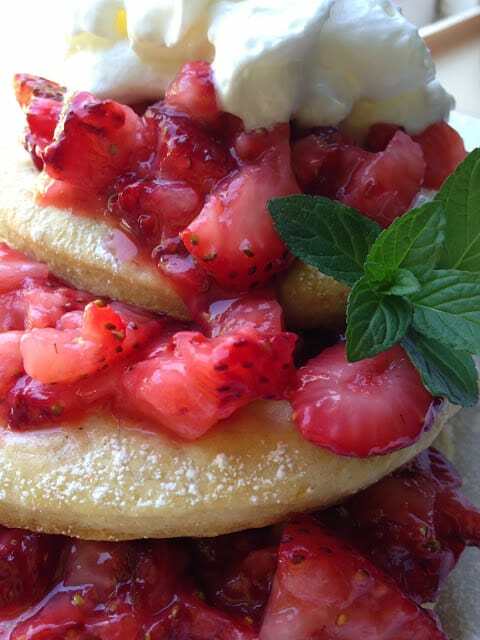 Lay several sliced strawberries on top of batter of each pancake. Turn pancakes when surfaces are covered in bubbles. Cook until golden brown. Place strawberries in a medium bowl. Mash lightly with a potato masher, about 6 times. 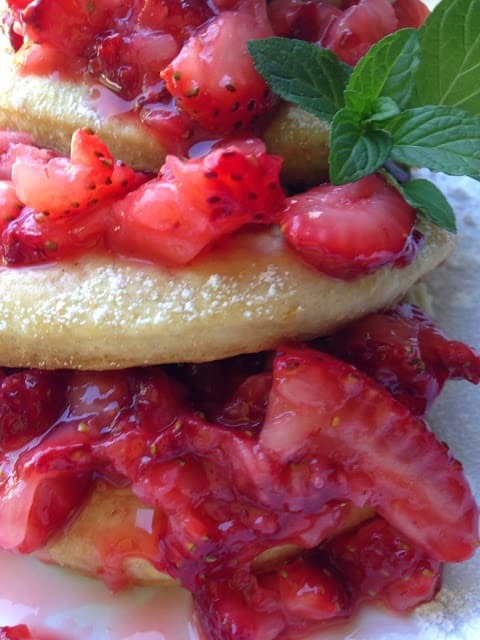 Mix strawberries with 1/4 cup sugar and crystallized ginger. Allow to stand at room temperature to macerate for one hour. In large, chilled bowl combine the heavy cream, 1/4 cup sugar and vanilla. With chilled beaters and an electric mixer on medium, beat until soft peaks form. Chill. 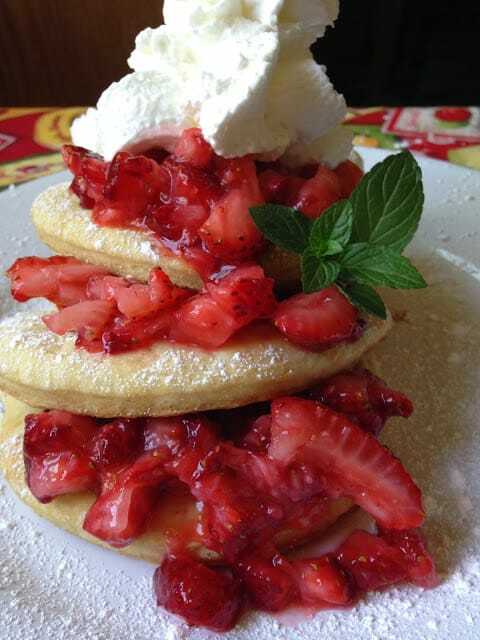 On a serving plate, layer pancakes, strawberries, and whipped cream. Garnish with sifted powdered sugar and a sprig of fresh mint. Strawberry Muddy Buddies is a delicious snack kids of all ages will love. I've just pinned this-thanks for joining the Say G'Day Saturday linky party. Hope you can join us again this weekend. G'day from Oz! I've just pinned your post to my Say G'Day Saturday board-thanks so much for linking up. Hope you can join us again this weekend. What a delicious recipe! I love the berries. Thank you Catherine~ Did you enter your recipe yet? Thank you Lena:) How are you?